Recorded in several spelling forms including Hinard, Henard, Henyard, and Hynard, this unusual and interesting surname is of pre 7th century Olde English origins. The derivation is from the words "henn", meaning a domestic fowl, and "geard", a small farm or a fenced area. It is said that the modern surname may derive from a now "lost" medieval village called "Henyard" believed to have been situated in the Suffolk area of East Anglia. It is in this area and the diocese of Greater London, that the surname is principally recorded in the surviving church registers of the 16th century onwards. What is know is that an estimated five thousand surnames in the British Isles do originate from lost villages of which the only reminder in the 20th century is usually the surviving surname, often, as with this one, in a variety of spellings. Early examples of the recordings include those of Fraunces Henyarde, who married Thomas Jarvis at St Brides church, Fleet Street, on July 19th 1626, Margaret Hynard, who married William Mason at the famous church of St. Martin-in-the-Fields, Westminster, on May 11th 1643, and Samuel Heynard, who married Hannah Briart at St Pancras Old Church, city of London. 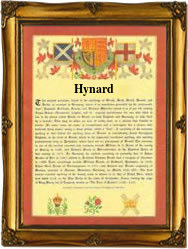 Perhaps the first recording may be that of Rose Hynard. This was dated March 9th 1584, at Bury St. Edmunds, in the county of Suffolk, during the reign of Queen Elizabeth 1st, 1558 - 1603. Throughout the centuries, surnames in every country have continued to "develop" often leading to astonishing variants of the original spelling.